Thomas M. O’Rourke of Holmes, N.Y., received a bachelor of science degree in environmental engineering . Shane A. Lyle of Millerton, N.Y., received a master of business administration degree . Clarkson University educates the leaders of the global economy. One in five alumni already leads as an owner, CEO, VP or equivalent senior executive of a company. 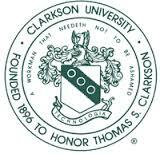 With its main campus located in Potsdam, N.Y., and additional graduate program and research facilities in the Capital Region and Beacon, New York, Clarkson is a nationally recognized research university with signature areas of academic excellence and research directed toward the world’s pressing issues. Through more than 50 rigorous programs of study in engineering, business, arts, education, sciences and the health professions, the entire learning-living community spans boundaries across disciplines, nations and cultures to build powers of observation, challenge the status quo, and connect discovery and innovation with enterprise.